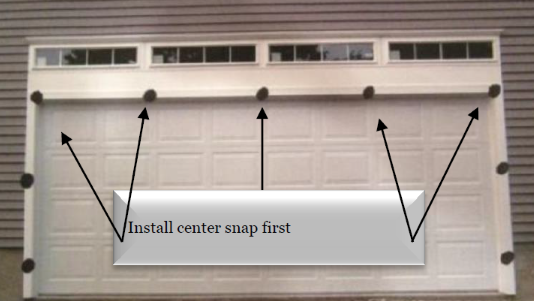 Thank you for your purchase of the Snap On Garage Screen. Our screen is available in 7 & 8’ sizes from 8X7-18X8 to fit a single or double garage doors. The installation instructions are simple and can be used to install either size. 5. Attach the corresponding female snap and continue to stretch, mark and install each of the remaining snaps around the opening. The screen can be stored up as needed by unzipping the center and rolling the screen to the top of your opening. Be sure to stretch the screen enough to get a snug fit but remain slightly relaxed to reduce stress on the snaps. The use of a 1/2 PVC pipe (not included) may allow easier rolling and storage of the screen in the opening.